Buy some of our arrangements! 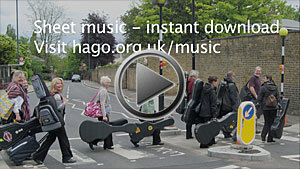 hago are taking a break from performing, so you might like to play some of our music! Derek, our Musical Director, has over 80 ensembles in print. You can browse through and see & hear samples in his ensemble guitar music shop. Order on credit card - despatched world-wide. Playing in a group is fun!